Element ClientConnect is a powerful web-based communications portal included when you purchase an Element LIMS license, that gives your clients quick and easy access to sample data, test results and documents–improving customer satisfaction and reducing your costs. 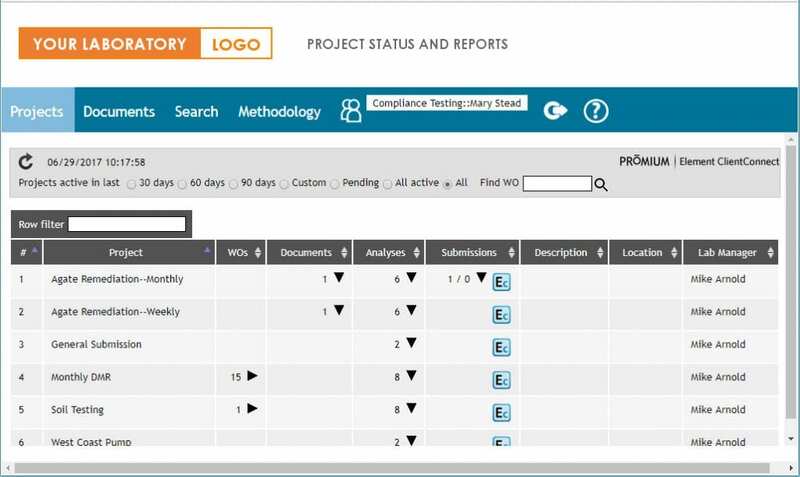 With your clients able to access information directly, they get quicker updates and your Project Managers spend less time answering the phone and more time managing laboratory operations. Need us to host Element ClientConnect for you? Reduce your IT and infrastructure costs by using Promium hosting services for Element ClientConnect. Don’t buy additional web servers and further burden your IT staff or outside developers, let us manage the infrastructure so you have more time to manage the lab. Your clients get quick and easy Internet access to their information and you save resources. Where does the work order data reside? The data remains secure on your servers. ClientConnect accesses your server and then presents the data in a status or detail report. Copies of downloadable files are stored by Promium for convenient access and then periodically updated to make sure your clients get the latest information.